Blog > Performance Engineering > Apache Groovy vs BeanShell: How to Make the Right Decision? See what makes Groovy, groovy. When running load tests in Apache JMeter, in many cases it’s necessary to choose a post processor/scripting language for certain tasks, such as handling SampleResult variables, assigning dynamic names to samplers or just adding some logic to scripts. 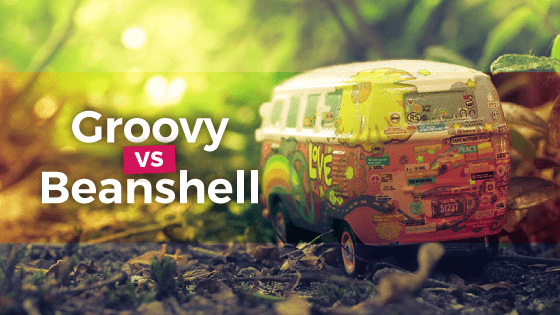 We have several options to choose from, but in this post we will look at two in particular: BeanShell vs Groovy and why we are partial to Groovy. But, instead of trying to convince you why we believe Groovy is the better choice, we’ll present the facts and let them speak for themselves! Apache Groovy, on the other hand, is a dynamic object-oriented programming language that can be used as a scripting language for the Java platform. Supports for loops and foreach loops etc. Perhaps one of the most important features that we have mentioned about Groovy is the fact that it’s statically compiled, which means that we can obtain top-notch performance, similar to what we would achieve using Java. We can clearly observe that Groovy results in outstanding performance where it reduces the time by half when executing on BSF Sampler (Bean Scripting Framework) and nearly a quarter when executing on a JSR223 Sampler (what replaces BSF nowadays). More great aspects of Groovy are, for example, its syntax, which is pretty straightforward, enabling you to write everyday sentences rapidly. Another feature that is also very useful is the __groovy() function that was introduced in the 3.1 version of JMeter. This function allows us to evaluate Groovy code anywhere in the script where usual functions can be placed. As you can see __groovy() function can be evaluated almost anywhere in the script, in this example we declared a variable with the text “It’s Groovy Right?” and then we applied a substring Groovy function to it and the result is being shown on the name of the sampler. It may take some time to adapt to Groovy. Even so, I think that after reading this brief summary of its pros and its cons, you will seriously want to consider migrating your post processors right into Groovy, so you can take real advantage of the outstanding performance and new features that it has to offer. We want to know: what are your experiences with Groovy?